The Cornish Rex dates from the 1950s originating in Cornwall, U.K. after a Cornish farmer found a curly-coated kitten in the litter of his farm cat. He took the kitten to show his vet who suggested he mate it back to its mother to what the results and to the farmer's surprise the new kittens were all born with the same curly coats. This chic-looking cat with its slender and muscular body more than holds its own in the feline beauty stakes with its prominent Roman nose and spectacular crimped coat that looks and feels similar to cut velvet. This cat's low allergenic "poodle-like" coat is low maintenance and so can be an ideal breed for many asthma sufferers to enjoy, who would otherwise have to forego cat ownership and so miss out on the warmth and delight that a cat brings to the home. This affectionate, intelligent, alert and playful breed enjoys human company and demands attention. This is a loving animal filled with boundless energy and would make an enchanting pet for children or the elderly. They become bored easily so you will need to give them plenty of toys to play with if you are away from home for long periods such as at work. They are usually compatible with cats and dogs which might be part of the same household. 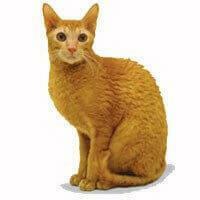 Most people agree that once they have owned a Cornish Rex they are reluctant to ever go back to another breed.